Transit time is the number of days after we ship until you receive your package. Below is an estimated range of transit times for different services. The actual Arrival Date quoted by the shipping company for your package will be displayed once you enter your zip code in the SHIPPING INFO panel on the right side of this page. *Delivery in 3-7 business days to Alaska and Hawaii. ***Delivery times are to most destinations. USPS Express*(No Tracking) 1-3 Days Delivery by 3:00 p.m.
UPS Standard service sometimes charges a Customs Brokerage fee when delivering the package, in addition to the shipping fee paid during purchase. USPS services do not have tracking capability. * USPS services: Note that USPS services do not have tracking capability. ** CANADA DESTINATIONS: Note that UPS Standard service charges the customer a Customs Brokerage fee when delivering the package, in addition to the shipping fee paid during purchase. Please be advised that this extra fee is the responsibility of the customer. Roofbag does not have control over this fee. The other services listed don't charge a customs brokerage fee. Also, please be aware that Canadian Customs occasionally can hold a package for up to two weeks. If a customer refuses a shipment, UPS charges an additional fee for returning the package to us. Please understand that in the event of a refused shipment, we must deduct all the fees charged by UPS before issuing a refund. FedEx collects duties and taxes when delivering the package. Yes, we ship to most countries in the world. - Go to Order page. - Select products by clicking on Add to Cart button for each item. - Click on Proceed to Checkout at the bottom of the Shopping Cart on the right. - Select Country at the top of the Shipping Information page that follows. - After a few seconds, shipping services available and arrival dates will be displayed. - Choose a shipping service, enter name, address and payment information. - Click on Submit Payment. If you need to add or delete items from the Shopping Cart after you have selected the destination country, first click on Clear Cart (green button at bottom-right corner of shopping cart) and then re-start the process. Otherwise, you will get the wrong shipping cost, which will delay your shipment. We surrender your package to the shipping company the same day we receive your order, if you place your order by 2:45 PM Pacific Time, Monday - Friday for UPS or FedEx shipping, or by 10 AM for USPS (US Postal Service) shipping. If you place your order after these times, or on a weekend or holiday, your package will go out the next business day. The actual day you receive your package depends on Transit Time, or time that it takes for the package to travel from our factory in San Diego, California, to your address. Enter your zip code in the "SHIPPING INFO" box at the right and you will see several shipping services and their corresponding cost. Below the box is the arrival date for the selected shipping service. Click on any service to select it and to show its corresponding arrival date. Click on the small down-arrow directly to the right of the box to see all shipping options available. 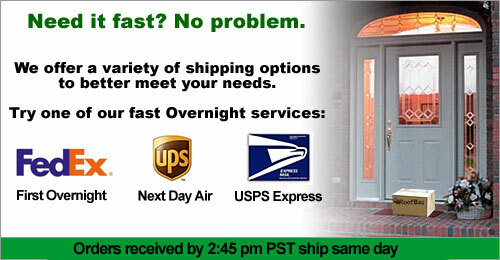 The Arrival Date, or Estimated Arrival Date, is a best estimate provided by the shipping company. These estimates are accurate about 98% of the time. We cannot guarantee that your package will arrive on the estimated arrival date shown, since about 2% of the time, the shipping company delivers a package late for reasons ranging from bad weather to overflow of their system in busy season. If shipping company delivers a package late and you decide to return the package, we will refund the value of the items purchased, but we cannot refund the cost of shipping both ways unless you have chosen a guaranteed service and the shipping company has issued a refund. (See below for list of guaranteed services). Even with guaranteed services, the shipping companies will not issue a refund if the delay was due to bad weather, system overflow or a faulty address. If you choose a guaranteed service, the shipping company will issue a refund for the cost of shipping if the package is delivered later than the date quoted during the purchase, except if the delivery delay was caused by bad weather, system overflow or a faulty address. WHAT IF I REALLY NEED MY ROOFBAG BY A CERTAIN DATE? 1. Order early if possible, so that you don't have to use one of the more expensive faster shipping methods. Use the SHIPPING INFO tool at the top right corner of this page to obtain a best estimate of the Arrival Date and Cost for different shipping methods once you enter your zip code. 2. Use the shipping method that best suits your needs. Use the Estimated Arrival Dates given by the SHIPPING INFO tool with caution, keeping in mind that any of these services may deliver in the afternoon, not necessarily in the morning, and also keeping in mind that on average, shipping companies deliver late 2% of the time. If you must have your package by a certain date, choose a shipping method with an estimated arrival date at least one day before the desired arrival date. WHAT IF THE ROOFBAG CARRIER ARRIVES LATE? In the rare event that your car top carrier arrives late and you wish to return it, please send us an email requesting a Return Authorization Number. (See more details in Warranty and Returns tab in the green menu). The money you paid for the items is fully refundable. However, the shipping fees (including the cost of returning the package to us) is only refundable if you have chosen a guaranteed service and the shipping company has issued a refund (see above for list of guaranteed services). Keep in mind that even with guaranteed services, the shipping companies will not issue a refund if the delay was due to bad weather, system overflow or a faulty address. WHAT IF MY PACKAGE GETS LOST? It is extremely rare that a shipping company loses a package (1 out of 4,000 packages in our experience). However, you should know what you can do to minimize your monetary loss in such an event. At the end of the purchase process, you have a choice between requiring or not requiring a signature when the package is delivered to your door. Safer: shipping company will reimburse for a lost package. But: Someone must be home to sign. Convenient: package delivered even if no one is home to sign. But: Customer takes responsibility for a lost package. If you choose SIGNATURE NOT REQUIRED, in the rare event that the shipping company loses your package, or claims to have delivered your package but you didn't receive it, neither the shipping company nor RoofBag.com will reimburse for or replace the lost package. Choose SIGNATURE NOT REQUIRED if the convenience of not having to sign for the package outweighs the small chance that the package may get lost and no one will reimburse you. Choose SIGNATURE REQUIRED if the inconvenience of having to be home to sign for the package is not as important as having the shipping company reimburse you in the rare event that your package gets lost. We give customers the choice of UPS, FedEx and USPS (United States Postal Service) shipping services. UPS and FedEx offer tracking information on all their services, while USPS does not offer tracking service. You will see all services available when you enter your zip code in the "SHIPPING INFO" box at the right, or when you enter your entire shipping address during check-out. USPS (US Postal Service) can ship to a PO Box address, but neither UPS nor FedEx will deliver to a PO Box address. If you want a package delivered to a PO Box, use one of the USPS services available for your destination. You will see all services available when you enter your zip code in the "SHIPPING INFO" box at the right, or when you enter your entire shipping address during check-out. DO YOU SHIP COD (Collect On Delivery)? You can pay by check by mailing the check to us. We'll ship as soon as the check clears. However, we don't ship COD orders. ARE THERE ANY EXTRA CHARGES BESIDES SHIPPING? We must collect sales tax (8.25%) for orders shipped within the state of California. Otherwise, there are no other charges for orders placed within the U.S.
HOW DO I KNOW MY ORDER HAS BEEN PAID or SHIPPED? If you entered your email address in the Thank You page at the end of your order, you will receive e-mail confirmations when we receive payment and when we ship your order. If you did not enter your email address when placing the order, you can check the status of your order by clicking on the link "Returning Customer Log In", at the top, right corner of this page. Enter your first and last name, and you will see a summary of your order and its status. If you click on the blue Order Number, you can see the details of your order. Yes. Packages shipped with UPS or FedEx can be tracked while they are in transit.